San Diego Haunted- ” The Lake Morena area is alive in history and Indian folklore, not all of which has been pleasant. The claims made by other websites may or may not be true, in either case they do not directly substantiate the original claims of the Lake Morena Ghost. The best written account of the paranormnal activity dates back to The San Diego Union October 26, 1983 by Helen Shaffer. According to the San Diego Union artice, Walter Stucker a park volunteer was suddenly awakened and looked out the open window by his bed in his motor home. He found himself looking “right at a tall man standing outside by the window. He was wearing a dark coat and knitted foul weather cap,” Stucker said. They looked at one another a moment, then the man turned and walked toward the lake. Stucker sat up in bed to watch through the window. “There wasn’t a full moon, but it was light enough to see clearly,” he said. “The man was taking very deliberate steps, but it seemed to me his feet weren’t touching the ground. They appeared to be about 6 or 7 inches above the surface. Supervising Ranger Tracey Walker also had two personal experiences to report concerning ghosts and the paranormal. While in a converted back office of the ranger station — originally an old concession building built in the 1920s “There are trees on that side of the building and lots of leaves on the ground. I heard footsteps out there. I was so certain of it, I laid my work aside to check it out. “But before I could do that the steps accelerated, came around to the side door, maybe 12 feet from me. They stopped right there. There’s a wooden lintel that extends under the door, inside and outside. It creaked and moved up and down and the doorknob turned once.” Walker continues, “By now I was really concerned. Was I having hallucinations? So I phoned down to the ranger’s residence and asked my wife, Jackie, to join me. I stood by the front door, watching her come. We went in, locking the door behind us, went to the back office, sat down and waited. “And it happened again. We both heard the steps and saw the lintel give. Three weeks later Walker had another experience where a Ranger log book had been set down and disappeared only to be found later that night in the Ranger bathtub. 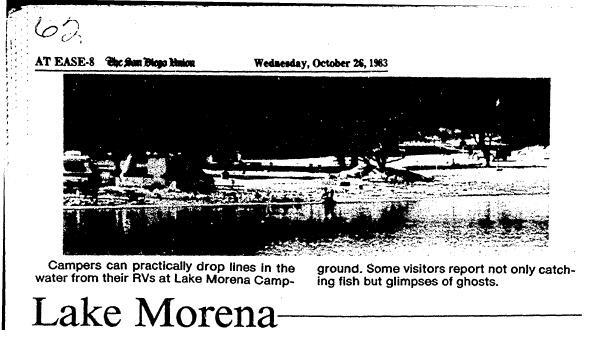 Flash forward 30 years later, the question remains is Lake Morena haunted? Garrett D. Recounted on Yelp.com in 2011, “It’s haunted. Seriously. I read about it on the county website. Over near the first large patch of boulders west of the campground a girl in white occasionally shows up to stare at folks in the middle of the night.” There are other persons not so quick to call the area haunted, and quickly point out the obvious fact that other campers either by want or accident may be to blame. 2 Responses to "Lake Morena Paranormal Ghost Haunt"
he foaming water or anything and it was just plain strange to me. I grew up in Campo and spent many a night in and around Lake Morena. There are wild things that go on there. I have personally had 2 ufo experiences near the lake, one of which involved a glowing orb that sat motionless only 30 feet from me. The other was a massive illuminated craft that slowly floated across the horizon. My friend and I also drove past a very strange creature late one night. Looked half human, half monkey and stood on 2 legs. Nearly everyone who has lived for any extended amount of time in Lake Morena village has a story to tell. I could write a book from all the stories my friends have told me, not even counting the crazy things I’ve seen myself.